We survived the Alaskan Highway! Just a quick note...I'm still away ffrom home. I'm in Spokane, Washington till Thursday afternoon. This was the hardest roadtrip ever, but good bonding time with my friend and the scenery was breathtaking. But it is really really good to be at a homebase. Were at Linda's sisters house with wifi, showers, a bed to sleep in, and real honest to goodness food. 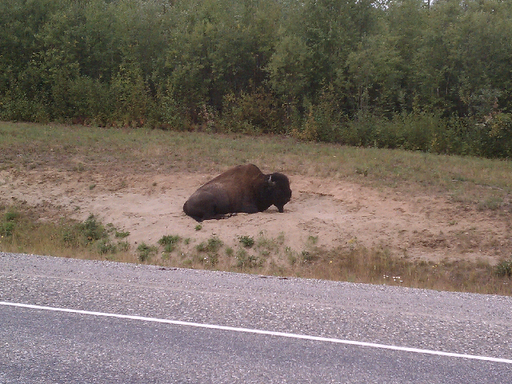 Here's a quick cell phone photo I took of a wild bison we saw on the side of the road. We also saw a moose, a huge owl, foxes, and mountain goat. No bears or eagles though. It sounds like a great trip - how amazing to see a wild bison. Have a good rest at your friends house - looking forward to hearing about your trip.